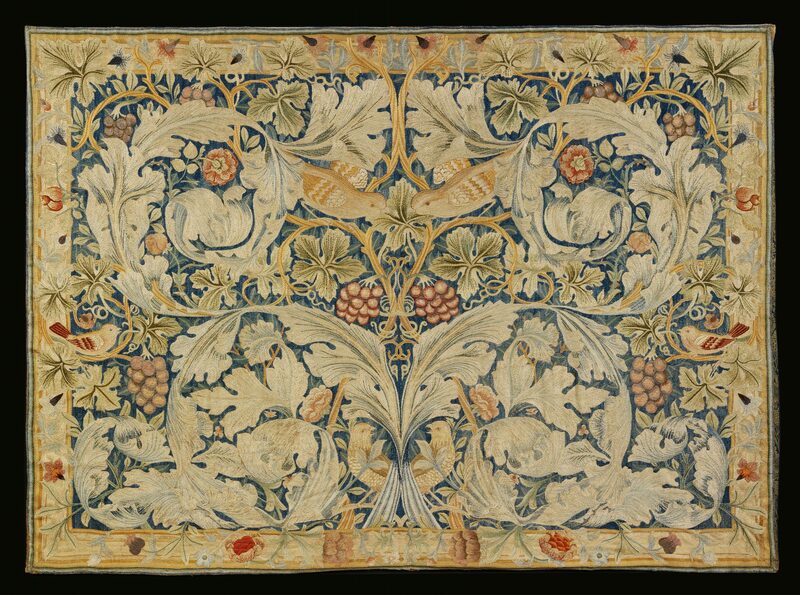 ‘Acanthus and Vine’ embroidery, designed by William Morris, 1879. Victoria and Albert Museum. In the public domain, courtesy of the V&A Museum. Contact the museum. Bernie Sanders, if metaphors must be sought, is an amalagam of two colorful, yet successful, species of birds—neither very good as game for humans, but ingenious at perpetuating their kind. The one, the woodpecker, through dogged unstinting persistence in seeking sustenance bug by bug (or, if you like, vote by vote). And the other, the cuckoo, by the audacious strategy of stealing the nests of other birds far more successful of building them, if only to brood until their young are hatched. Even those people who, like me, view the prospects of the Bernie Sanders nomination campaign as, at best, quixotic, wonder at what his motives might be in soldiering on. His only rallying banner is a vagrant hope that the numbers will, in the end, play his way. Much as I am persuaded, and have been from the first, that he has no chance, I also believe that, in a tradition far older than even he is, there is a method and a purpose to perpetuating what is likely to be yet another noble, if futile, crusade. Going back as far as Aesop, for sure, but closer to our own epoch (in the times of Chaucer), I believe there is once again something to be gained in understanding by comparing human behavior with those of our fellow creatures, and especially the birds of the air. It’s an apt trope to do so, as a pursuit like Bernie’s, joined by his followers, is as theoretically unlikely as the idea of manned flight—like our avian cousins do by nature—would have been in the late Middle Ages. 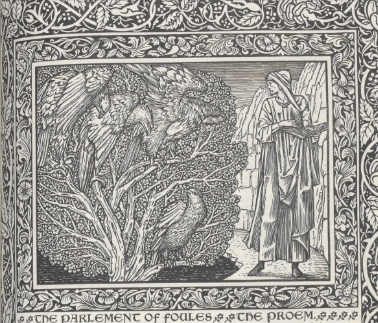 Chaucer first attracted attention with his earlier shorter poems, but the one that interests me in particular is the one known as “The Parlement of Foules,” which I name in the original Middle English because of the particular way that the last word, which is “fowls” (or birds) in modern English, is pronounced. It’s a homonym for “fools.” And indeed the words were often spelled the same way at the time. 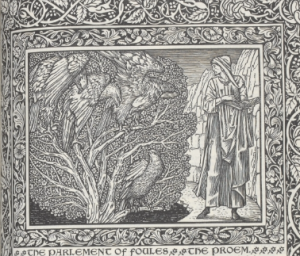 The way in which the lesser species of birds that constitute the “Parliament” called by Dame Nature in Chaucer’s dream-vision in order to choose their mates—but only once the noblest of the birds, the eagle, has done so—are depicted, in their arguments and their deportment, the similarity of an assembly of fowls and a congress of idiots was no doubt meant deliberately to resonate. In the end, the lesson of the poem seems to be that even in this, the highest calling of a creature seeking to perpetuate its kind, Nature dictates that from the most superior of species, the eagle, to the lowest, free will is not only the rule of Nature’s law, but paramount. It’s something we forget in the process of running primaries to choose candidates for the high calling of chief executive of our country. The difference is, in Chaucer’s assembly of birds, even the most lowly know their place—it doesn’t prevent them from saying foolish things, but such too is nature. It has occurred to me—absent any deep meditation on these esoteric cultural and linguistic oddities—that if there was a descent of any sort, as perceived in the milieu of the political season of 2015-2016, it was the appearance of Bernie Sanders in the midst of the sure-thing—a cake walk is what was expected—candidacy of Hillary Clinton. And if there is any politician who emulates the still small but persistent and inevitably annoying and ceaseless pecking of the woodpecker, it is Bernie. Throughout his entire career. 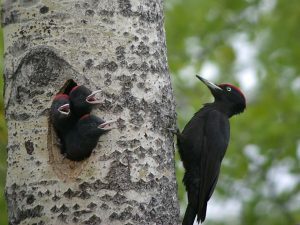 Male Black Woodpecker tending to his young. Finland. Criticized for not being the author of any major legislation—presumably on the premise that, in politics, as in all dimensions of the Trump universe, or any machismo ethos, bigger is better—Bernie Sanders has nevertheless ensured that legislation of benefit to his constituents has always gotten through. And he does it by dint of never letting up, peck peck pecking away at his colleagues on both sides of the aisle… as this is one woodpecker who has never declared anything but its indendence, as is characteristic of the species of bird I’m saying he emulates. Bernie has, indeed, had a long career of continuous pecking, never wearing out his beak, and apparently with the same protective adaptive features that have left his head and brain intact despite all those percussive collisions. I’d like to suggest that Bernie, a loner in other regards insofar as his has been a lonely vigilant stand through eight terms in the House, and now well into his second term in the Senate—fiercely unaffiliated—he has become, for the sake of opportunity, if no other sake, a bird of a somewhat different stripe in his run for President. However, there is even some consistency in this, given what may also be seen as a political career as an unabashed spoiler. Having spoiled the chances of opponents from both parties running for state office in Vermont earlier in Bernie Sander’s career, while representing a third party that had no chance of winning any seat, forcing the elections into the state legislature for two different offices in the state, he is no stranger to being a spoiler and a disruptor. Yet he had sufficiently established his bona fides of being a willing ally, even as long as he kept himself wrapped in the cloak of independent affiliation, that he won the support, direct as well as tacit, and was enabled by the Democratic party establishment to run against a Republican candidate while funds were withheld from any would be Democratic candidate in one election. And in another, he handily beat a Democratic opponent, who ran unopposed by the Republicans who, predictably, once you discover the circumstances of this strange sequence of events, found the Democratic candidate unobjectionable, and not worth the cost of opposition. Now, anyone with an adequate amount, not a lot, but adequate, knowledge of the political history of the 20th century, segueing into the current one, will have to acknowledge that, in fact, there’s always been a thin, if discernible, amount of difference between the parties. Bernie Sanders, recognizing this fact long since, and realizing he could still reach goals and do some good work, even without doffing the mantle of his independence, learned to get himself into office, and once there, whether as Mayor of Burlington or as an eight-term Representative to Congress, followed by a full term and then re-election to his second term in the Senate; a position to which he will return after the presidential campaign is ended, unless he wins the nomination as a very long shot. All in all, whatever his chances at capturing the Democratic nomination, Sanders has the distinction of being the longest running independent politician to hold seats in Congresss in history, albeit he participates in and votes with the Democratic caucus (to the extent of voting with them on significantly more than 90% of the time). He joined the Democratic party in 2015, in order to run as a mainstream, rather than a hybrid maverick sort of candidate. However, having ingratiated himself with the Democrats at the same time that he has developed a reputation as a spoiler—in many senses—I’d like to suggest that rather than spoil the chances Hillary Rodham Clinton so richly has come to deserve, at least in the eyes of her most ardent followers, Bernie is merely following his political instincts and in the process adopted the habits of yet another avian species. There is no pun intended here (etymologically, the name has nothing to do with some of its present-day derisive connotations, as there is nothing crazy about the behavior of the bird known as the cuckoo). Rather, I’d like to suggest that even more insidiously, and certainly strategically, Bernie is doing exactly what certain species of cuckoos do. Reed warbler feeding the chick of a Common Cuckoo. Clearly it hardly impinges on Bernie’s conscience that, having embraced the Democrat banner for his own run at the office of President, he is assailed for being no true Democrat. As indeed, I’d suggest he isn’t. He’s a cuckoo—and his sometime impish grin suggests he enjoys the role, even as he waits for his eggs to hatch. But the question remains, why does he do it? even at the risk of effecting a far more disastrous result of spoilage—that is, the ruin of the chances of the Democratic nominee to win the election in November. To speculate, never mind anticipate, never mind fretting over, such a prospect I think is a waste of time, and a waste of the expense of positive spiritual energy—call it hope, if you like. Certainly, it’s unrealistic, if you manage to be cold-blooded about contemplating the game. Bernie has often won the legislative gains he has won in a long career the same way, by holding out until the end. He knows, bearing an older, and certainly far more savvy and experienced political head, that timing is everything, and the greater risk is in capitulating too soon, that is, giving up, when nothing is lost by holding out, and everything is to be gained. I’d suggest he knows, even with his own long odds, that if he holds out as he has until July and the Democratic convention in Philadelphia, the upside is that he will have a maximal effect in moving the party, and its nominee, especially if it’s Hillary, not to mention all its other nominees in lesser contests for Congressional and Gubernatorial seats, closer to the left position he occupies. It’s ridiculous to think that he believes, with his intelligence, experience, and political savvy, especially as an outlier, spoiler and maverick, that his program of progressive inversion from the status quo will be or could be instantaneous. However, if the Democratic party, which by many accounts of (again I must use the term) cold-blooded objective analysis of trends is leading a general movement of the entire electorate back toward the liberal bias the country ran under through the 60s, it is imperative that the Democratic platform and candidate espouse definitively more liberal views than Hillary Rodham Clinton was willing to campaign with when this current season began. She has already been moved in that direction. Bernie wants to push her further, before he no longer can effect any influence, because positions will be set as of the adoption of the platform and the convention’s adjournment. He also knows, to neutralize the other great fear that drives the growing enmity for Bernie, that he will not ruin the chances of the Democratic nominee to counter any momentum gained by the opposition. He knows the campaign will begin in earnest, the battle will be joined, only when the nominee is announced, with fully three months-plus before election day. He also knows the Trump campaign, the continuing equivocation of the Republican Party confronted with rallying behind a universally repugnant nominee, and other factors that will deter the start of any true—and threatening—momentum will not be resolved overnight. With further victories, or even close calls, in the remaining primaries, no one, least of all the Republicans—and however certain the outcome intuitively seems to be—can say with dead certainty what the Republicans will have to argue against. 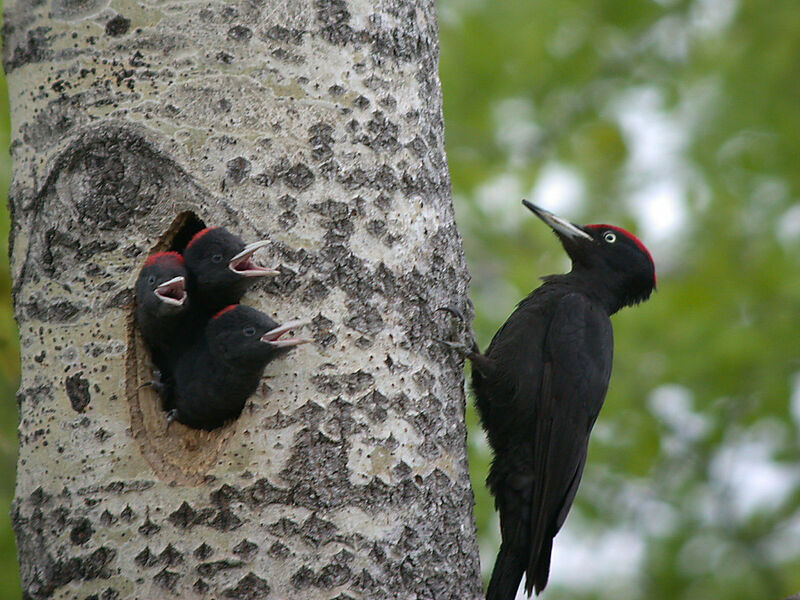 So Bernie the woodpecker, as he ever has in 40 years in politics, will keep on pecking, subsisting on the bits of bugs and other dainties he ceaselessly digs out of the trees in the vast forest of delegate votes. And having learned the benefits of nesting where he can’t successfully build a nest of his own, he’ll be content to brood and wait and see what hatches when his eggs begin to crack open. One small note, before I go, and this is true. 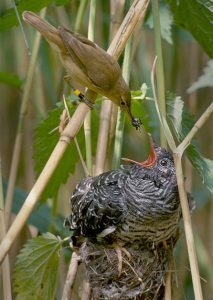 The term of venery, that is the collective noun, applied to a collection of cuckoos is “asylum.” I like that. An asylum of cuckoos to go with a descent of woodpeckers.